After the fortuitous meeting with Babaji, the next decade saw him go through a dichotomy of experiences -both material and mystical – combining the adventure of his teenage years with the esoteric magnetism of religious texts and the spiritual allure of local holy men and saints. He met Yogi Gopala Saami, Kaladi Mastan, Swami Abhedananda, Chempazhanti Swami, Swami Tapasyananda and Mai Ma during this time. At nineteen, wise beyond his years, he embarked on his journey to the Himalayas, seeking a true Master. While traveling to Haridwar – the gateway to Badrinath and Kedarnath – his name and appearance evolved to that of a jigyasu (seeker of truth). His journey progressed to Rishikesh, where he lived in the Divine Life Society for couple of weeks. During this interlude, he practiced yoga, attended Upanishad classes, visited nearby ashrams, and interacted with seemingly enlightened holy men in search of his own Master. He then traveled to Badrinath – a 220 km soul-seeking passage on foot – arriving famished in the town of his destiny. Assuming his search was futile, he gave up hope and was on the verge of giving up his life. About to jump into the Alaknanda River, his fortitude was rewarded by the luminous appearance of his Guru Babaji, who swiftly took him under his spiritual tutelage and initiated him into the Nath tradition. His Master then encouraged him to return to the plains – to start a family life and prepare for his life’s mission. He was periodically instructed to visit holy places across the subcontinent – Marutwa Malai, Ajmer, Dakshineshwar, Belur Matt, Puri, Benaras, Alandi, Shirdiand Tiruvannamalai – to familiarize himself with diverse spiritual traditions. He met saints from all religions including NeemKaroli Baba and, also interacted with LaxmanJoo and J.Krishnamurti. Few years after his Master passed away, he received the spiritual go-ahead to commence his mission. In 1998, he started his teachings, eventually leading to formation of the Satsang Foundation. In 2011, he wrote his memoir “Apprenticed to a Himalayan Master – A Yogi’s Autobiography“, which became an instant bestseller. Satsang Rural Vidyalaya – Located in the hilly hinterlands of Ma Konda behind Satsang Nagar, the Satsang Rural School has an unique and innovative approach to education. The Peepal Grove School – a co-educational, residential school committed to providing an environment conducive to the in-depth exploration of knowledge. He is married and has two children. 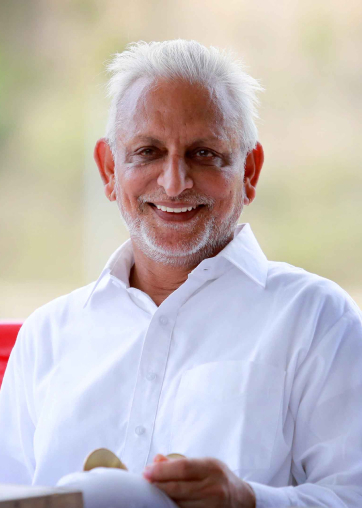 Based in Madanapalle, Andhra Pradesh (three hours drive from Bangalore), he leads a simple life – teaching and guiding the Satsang Foundation and Manav Ekta Mission. Appreciative of music, he leads the satsangs often with his mellifluous voice. He also writes and paints in his leisure time.